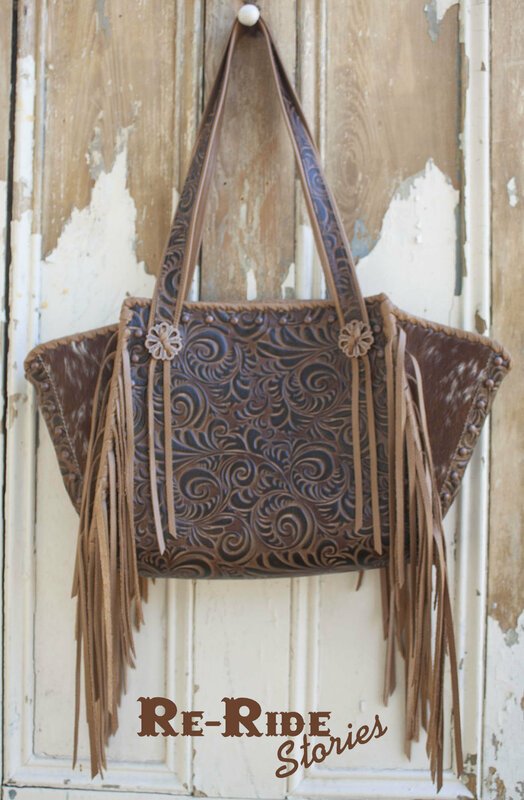 This beautiful tote is handmade with a western spiral embossed leather and hair on cowhide. 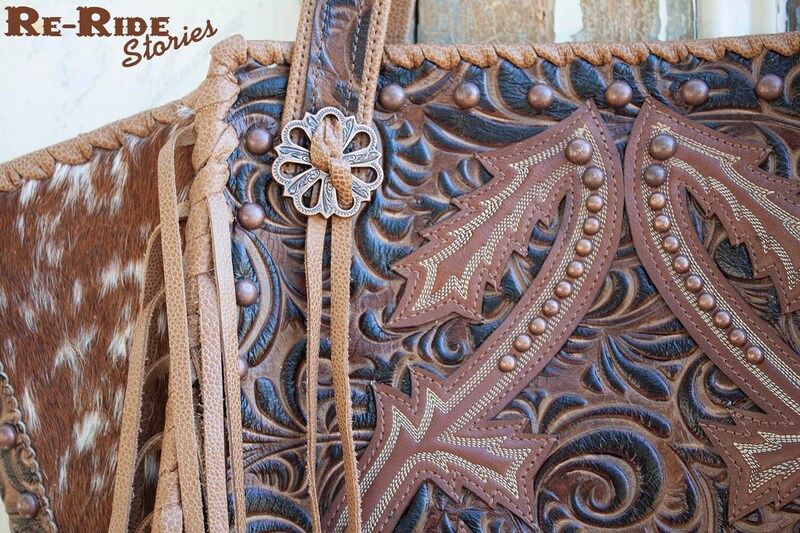 The front is adorned with pieces cut off an old pair of cowboy boots and copper spots. The sides are trimmed with embossed leather. 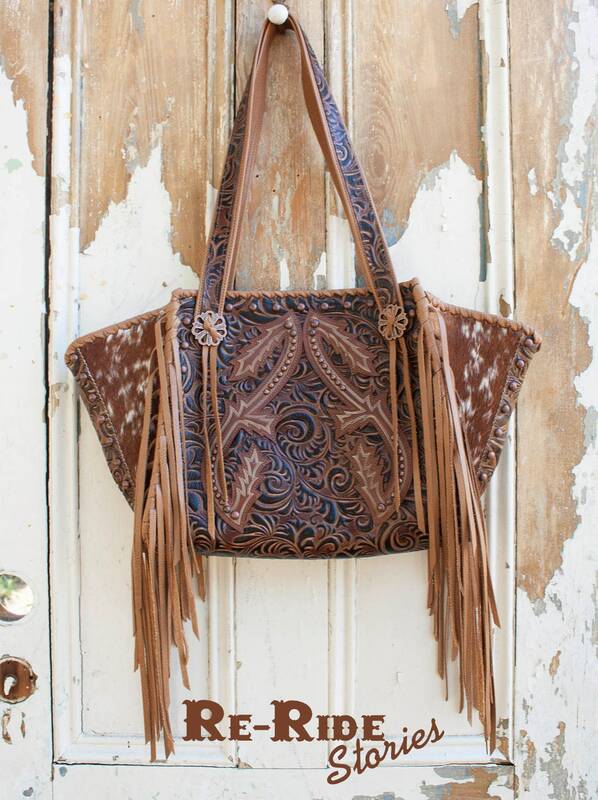 The tote is laced with leather and matching leather fringe. The inside is lined with leather and there are two open pockets. The tote stays closed at the top with strong magnets hidden inside the lining. This tote measures 20" wide and 11 1/2" tall. The straps are made with matching embossed leather and adorned with copper western conchos. The straps are 1 1/4" wide and measure 30" long and are non-adjustable. We require all payment to be made through Paypal or Etsy Direct Checkout. Buyers can use a credit or debit card, a Paypal account is not required. Payment must be made within 2 days of purchase, or the order will be canceled. Orders will not be processed until full payment has been received. For items that are in-stock, we ship within 3-5 days of receiving your full payment. We ship all orders with delivery confirmation and insurance, the cost of these is included in your shipping price. All items will be shipped with the correct U.S. Customs form attached, which will be completed based on applicable U.S. laws. We will NOT mark any item as a "gift". **We are NOT responsible for duty charges, tariff fees or brokerage fees. ** We comply to all federal and international guidelines for shipping, and we reserve the right to refuse shipment to any country the U.S. government deems "restricted". If you have any questions, please contact us BEFORE you buy. If you have questions regarding your country's duty rates, please contact your local postal or customs office. *We are NOT responsible for item wear that is a result of customer negligence such as the following; obvious hair loss due to constant friction/rubbing, over packing, exposure to harsh environmental conditions like water or sun damage. *We do not accept returns for a refund. *We will however, exchange for an item from our shop, or issue a store credit within 10 days of purchase/delivery. In order for us to accept your exchange, the item must be in unworn, and in original condition. *No returns will be accepted without a Return Authorization issued by Re-Ride Stories. 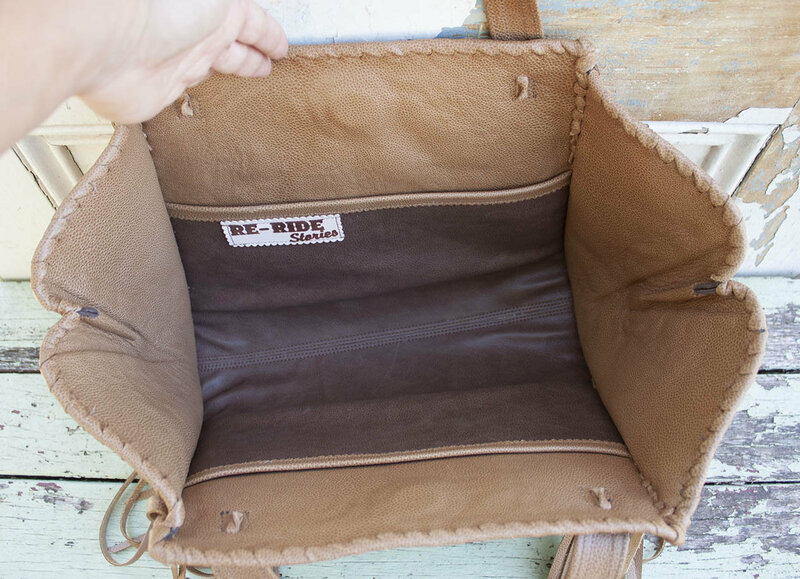 All of our products are made with genuine leather and/or hair on cowhide. 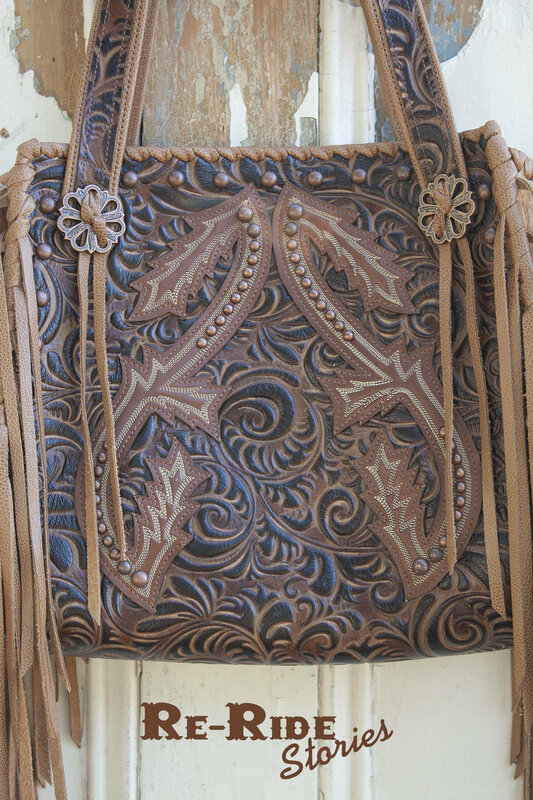 Each leather hide varies in weight, texture, colors/dyes, and various embossed or hand tooled patterns. Over time, ALL hair on cowhide WILL shed! 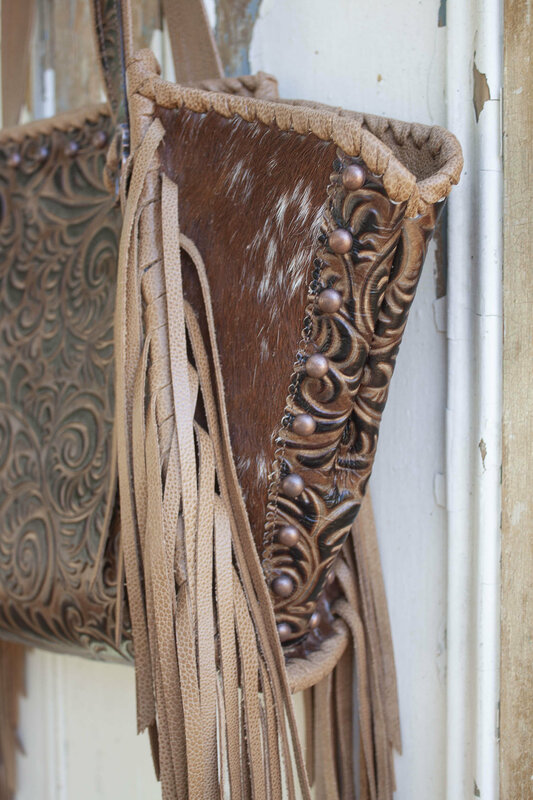 This is to be expected with any hair on cowhide item and there are several factors that can lead to this happening depending on the type of cowhide, how the hide is tanned and finished and how you treat it. To help prevent hair loss, limit friction that would rub on any hair service or scratch any tooled or embossed leather. We do not recommend putting any type of fixative on the hide to prevent shedding, that will more than likely ruin the cowhide. Some embossed pre-dyed leathers can fade over time if left in the direct sun for long periods of time. Extended exposure to sunlight or florescent lights can fade or discolor dyes used on the hand tooled items. To clean your hair on cowhide item, use a mild soap and damp cloth. NEVER completely submerge cowhide or leather products into water. All the leather we use will have a protectant seal or finish, but this will NOT prevent damage due to damp or harsh conditions. You can lightly vacuum hair on cowhide with a soft brush attachment. We use a product call "Renapur" along with a very soft sponge for our tooled and dyed items. The use of other oils & cleaners could stain, lighten or completely strip dyes and paint from finished products. Do not scrub over or over saturate any of the leathers as that will lead to dryness and cracking. We suggest using proper leather care for all hair on cowhide and tooled leather items to help increase the lifespan of your purchase.